In 2014, the Gulf network carriers – Emirates, Etihad and Qatar Airways – offered 2.7 million seats into the US with barely a peep of public antagonism. But now the US-Gulf carrier dispute is a loud topic. Is the sudden attention to Gulf airlines clouding judgment? In recent weeks Emirates and Qatar Airways have announced growth in the US: Emirates adding Orlando as a destination and increasing Boston and Seattle services while Qatar will open Atlanta, Boston and Los Angeles while growing New York JFK, with plans including A350 deployment. The US axis is asking for a freeze on Gulf carrier capacity, making some suggest Gulf carriers are expanding "while they can" or are growing to antagonise US carriers. Atlanta may be a good market, but Qatar announcing service 14 months in advance will ruffle Delta feathers. “Maybe it’s a coincidence at this time" Qatar is opening Atlanta, CEO Akbar Al Baker said on 13-May-2015. 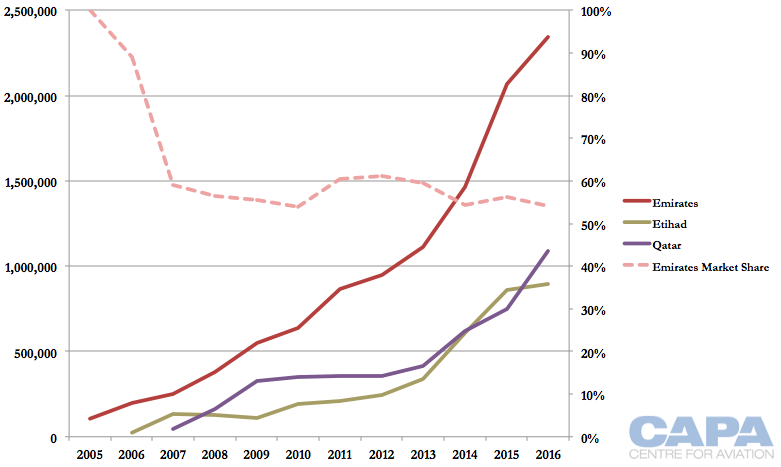 Looking at historical growth rates, the Gulf carriers are picking up pace. This may well be simply a feature of market opportunities evolving. The Gulf carriers have been under-represented in the US, which is now showing signs of economic strength while other long-haul markets are facing currency or bilateral constraints. Qatar Airways announced plans in May-2015 to add three US destinations in 2016: Atlanta, Boston and Los Angeles. This will bring Qatar's US network to 10 points, the same as Emirates. Etihad serves six points. Qatar will be the first Gulf carrier in Atlanta, second in Boston (there is existing Emirates service) and third in Los Angeles (Emirates and Etihad serve the point). The addition of Los Angeles brings to five the number of US cities to be served by all three Gulf carriers. Qatar also announced its New York JFK service will increase to double daily, its first US point to have more than a daily service. Emirates plans to offer four New York JFK services (three non-stop and one via Milan) and Etihad is double daily. Qatar's growth announcement follows Emirates' announcements in Mar/Apr-2015 to add the new point of Orlando and a second daily flight to each Boston and Seattle. Earlier in 2015, Emirates announced plans to up-gauge Dubai-Milan-New York from 777-300ER to A380. Qatar's simultaneous announcement of three new destinations and an increase to New York was bold. Its Gulf peers - its main competitors - may see there is a business case for US expansion but discretion should be exercised given sensitivities. Qatar made its announcement with significant lead time: Los Angeles is to be launched 01-Jan-2016, New York goes double daily 01-Mar-2016, Boston is to be launched 16-Mar-2016 and Atlanta will be opened 01-Jul-2016. The Atlanta service is still a few months away from being placed in the GDS and available for sale since flights are loaded only 11 months prior. In Apr-2012 Mr Al Baker said Qatar would serve the three points (Atlanta, Boston and Los Angeles) but also said Qatar would serve Detroit and increase New York with one-stop service via European cities. Many of these routes were pegged for operation by the 787. Detroit and the Doha-Europe-New York routes have not eventuated, and the three new US routes now flagged will not be opened with the 787. Boston and the second daily New York will however be launched with the newer A350. The three US airlines – American, Delta and United – asked the US government in Jan-2015 to "request Qatar and the UAE to voluntarily freeze air service at then-current levels pending the resolution of this matter", the three US airlines said in an Apr-2015 letter. "It is now apparent that the Gulf carriers are taking advantage of this delay to change the facts on the ground, rushing to add new widebody service in an attempt to gain even more market share before the U.S. government acts to counter their subsidized expansion. In recent weeks, Emirates has announced new service from Dubai to Orlando (effective September 1), added a second daily flight from Dubai to Boston (effective October 1) and from Dubai to Seattle (effective July 7), and announced that it will up-gauge its Milan-New York flight to a massive A380 (effective June 1). Beyond the announced new service, we understand that one or more Gulf carriers have contacted three additional U.S. airports about starting new flights from the Gulf." After announcing Qatar's 2016 US growth, Mr Al Baker addressed ulterior motives for expansion. He remarked: "We don't talk about reprisals. We are a mature airline and we don't get into reprisals. We are just doing our job, our expansion." No doubt Delta still feels differently. Until recently, there was little notice or public clamour about Gulf carrier growth in the US. Emirates was the first in the US, launching in 2005. In 2013 the three offered under two million seats to the US. Following Qatar's 2016 growth plans, the expected capacity so far is more than twice 2013 levels. Gulf carriers are forecast to have just under 4.5 million seats to the US, but this figure is likely to grow as further growth announcements are made over this year and next. It is unusual to already have large growth announcements more than a year out. Gulf carrier US growth rates tell a mixed story. Etihad's nearly 80% US growth in 2014 is a historical high while Qatar's approximately 50% growth in 2014 – and again in 2016 – is a high since 2009 when Qatar's presence was small and thus increases distorted by a low base level. Emirates' 40% growth in 2015 is its highest since 2009, when it was a quarter of its size. As the growth rates are distorted by changing base sizes, the situation can also be dissected by looking at the net addition of new seats each year. In some instances, a year's growth reflects capacity put into the market mid-way through the previous year. For example, the additional seats generated by Emirates' 01-Sep-2015 launch of Orlando flights will mostly be reflected in 2016. Part of Qatar's 2016 growth plans (so far) will be reflected in 2017 figures. In 2015, Emirates is adding a record 600,000 seats to the US. This is 70% higher than the 350,000 seats added in 2014 and 164% of the 230,000 seats added in 2011, its third-highest growth year. Qatar's growth of 340,000 seats in 2016 (so far) is 69% greater than the 200,000 seats it added in 2014 and 111% the 160,000 seats added in 2009. Etihad in 2015 is so far forecast to add 250,000 seats, down from a peak of 270,000 seats added in 2014. The pro-US airline group will no doubt seize on such figures, but the larger picture is more nuanced and could suggest other reasons for growing in the US. An unusual Gulf carrier dynamic is that Etihad has been larger than, or close to, Qatar Airways in US capacity despite Etihad being significantly smaller than Qatar. 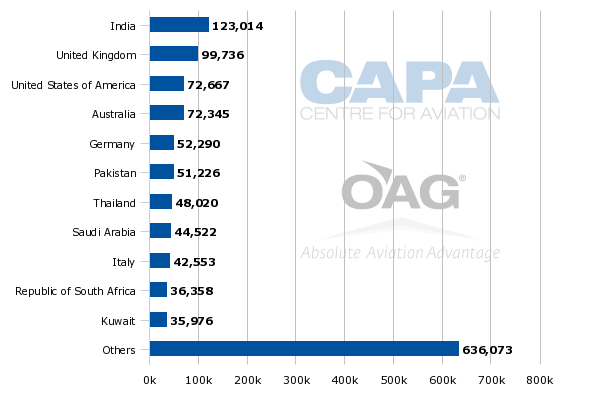 This gap was especially narrowed in 2013, with Etihad subsequently overtaking Qatar in size. It could be argued Qatar's US growth is overdue in relation to Etihad's network. Both Etihad and Qatar frequently refer to the fact that their greatest competitors are those nearest to them at home. 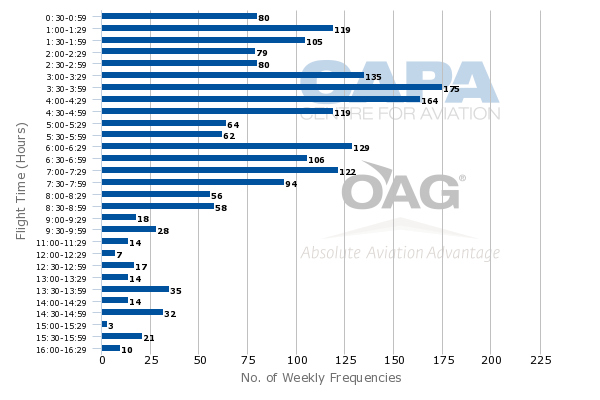 And, in most of the markets effectively on-served by the carriers, the US airlines are the least of their competition (and vice-versa). 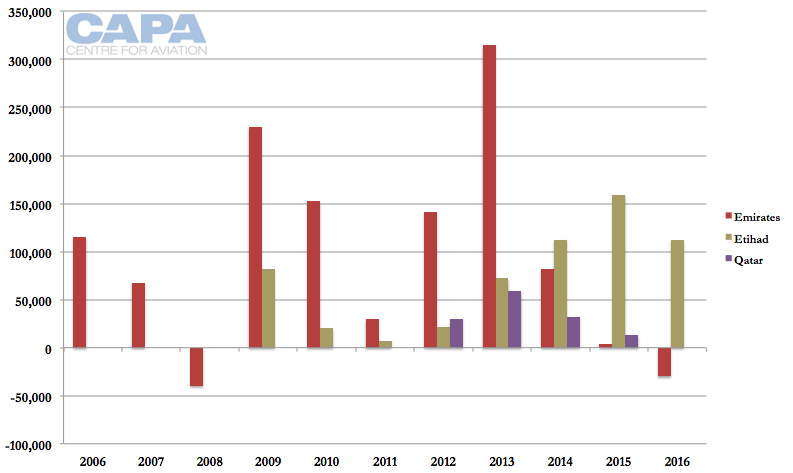 Emirates may be having record growth in 2015, but its relative position in the US-Gulf market is unchanged. Since 2007, Emirates has accounted for about 55-60% of Gulf carrier capacity in the US. Emirates has not spoken of a market share objective in the US, but if it wishes to harness growth opportunities, it will have to grow proportionately as Etihad and Qatar do so. Historically, Etihad may have been far-sighted in building a US network or Qatar may have lagged. More recently, Etihad's accelerated US growth beginning in 2013 is likely linked to two key strategic developments. These relate to India, a key – but not exclusive – source of traffic for Gulf carriers' US flights. 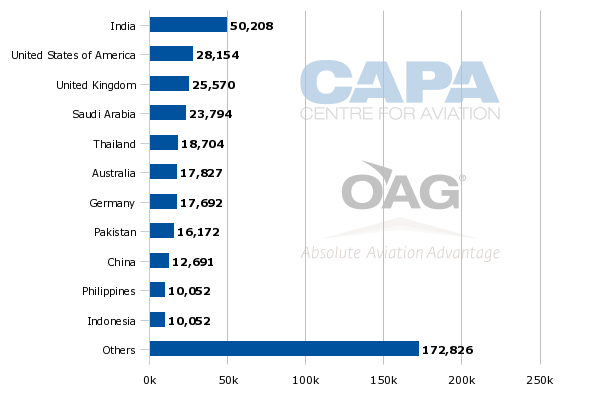 In Dec-2014, CAPA looked at the estimated source markets for Gulf carriers, with India accounting for an estimated 36% of Etihad's US traffic. Etihad's minority acquisition of India's Jet Airways produced a number of strategic advantages. First, Etihad gained access to Jet's India-Abu Dhabi network, allowing Etihad more feed for US capacity. India restricts Gulf carrier capacity and the Gulf carriers routinely hit their bilateral allowance. They could easily use multiples of their Indian capacity allowance. Without onward seat availability, the Gulf carriers could not grow US traffic. Second, Etihad has been short of ultra-long-haul aircraft needed to reach the US. Etihad was able to utilise surplus Jet Airways aircraft, some being placed directly on US services and others elsewhere on Etihad's network that in turn allowed for fleet re-shuffling to expand in the US. Most of Etihad's services are in the medium/long-haul category, with ultra-long-haul a small proportion. Another factor at the time of the Etihad-Jet Airways deal was the expansion of capacity allowances for Etihad into India. Although this occurred on the eve of the Etihad-Jet agreement, the parties have staunchly denied suggestions that greater capacity rights were granted as part of the Jet deal. Whatever the circumstances, the outcome is that Etihad, with Jet, now has greater India capacity to feed more US flights. 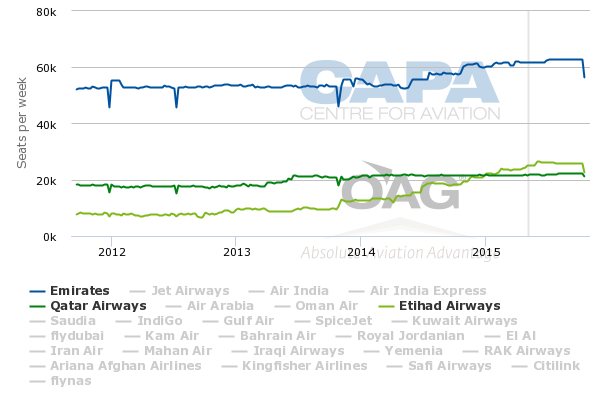 Etihad's growth to India, in light green on the graph below, shows its expansion. Emirates has also received expanded rights, but proportionately less than Etihad, much to its frustration. Emirates' capacity (blue line) also helps fuel growth west of the UAE. In comparison, Qatar's size in India (dark green line) has not significantly expanded, making it challenging to fill US growth as the obvious connecting market – India – is not growing. With Qatar's large expansion in 2016, it will be interesting to see what other markets Qatar links the US with (if there is no India expansion). Etihad is punching above its weight in India and the US when comparing its size in those markets to the far larger Emirates. The US is Etihad's second-largest market whereas for Emirates it is the third-largest. While it might be argued Qatar's US growth is overdue, all three US carriers have more opportunities in the US in the long-term. The question is at what stage growth is implemented. The US is the second largest long-haul market for Gulf carriers, but comparing the population and travel size to other large long-haul Gulf markets, it is clear there are further opportunities for Gulf carriers in the long term. There is a valid comparison with the relatively small Australian market. Australia has similarities with the US: it is the other leading ultra-long-haul market for Gulf carriers and each has powerful intermediary challengers (Asian carriers between Europe and Australia, European carriers between North America and Asia/Middle East/Africa). Emirates entered Australia in 1995 and Etihad and Qatar followed in the mid-2000s, mirrroring their entry into North America. Emirates' additional 600,000 US seats in 2015 stands out. To recall, this is greater than the additional 350,000 seats it injected in 2014 in the US. As a point of reference, Emirates in 2013 added 320,000 seats into Australia. 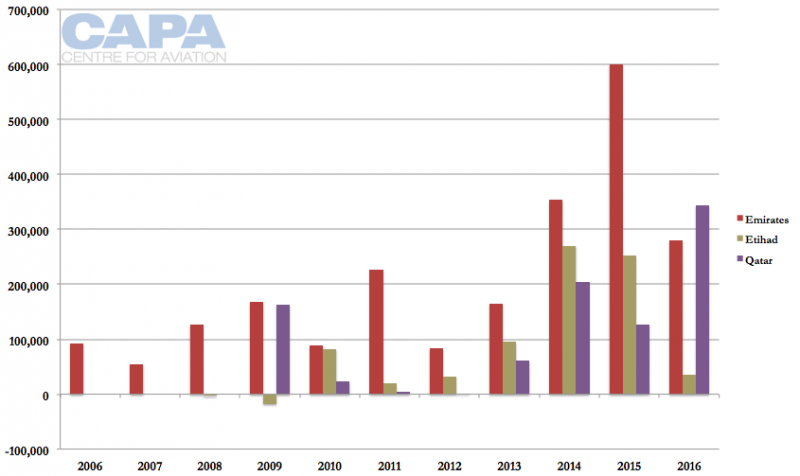 Australia has one tenth the population of the US and the Gulf carriers do not operate to Australia under an open skies agreement as they do to the US; instead the Australia-UAE agreement has allowed phased growth. In fact Gulf carriers are frequently up against their bilateral limit in Australia. Etihad in 2015 plans to add 150,000 seats in Australia compared to 270,000 seats in the US in 2014 and 250,000 in the US in 2015. 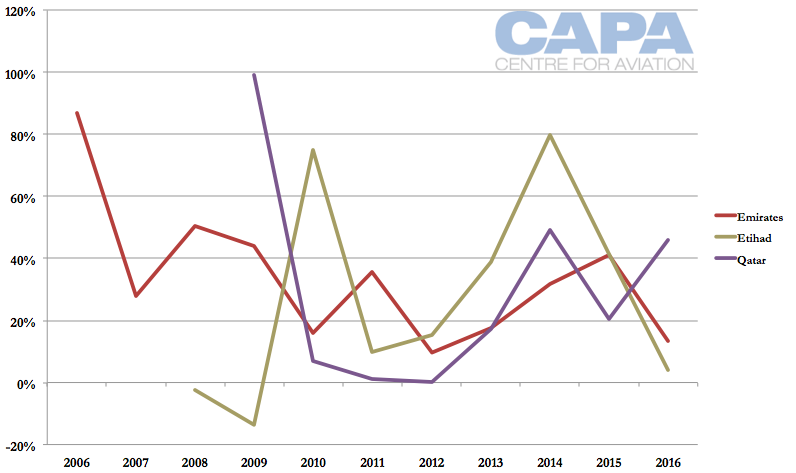 Qatar's Australia growth has been smaller due to more difficult bilateral constraints in the Qatar agreement. Nonetheless, proportionately the Gulf airlines occupy a much larger share in the Australian market than in the US. In global airline market terms, the US is an obvious choice for expansion; most long-haul airlines are either expanding there, or considering it. There is no guarantee of what the US government's review of US airline's "White Paper" claims will produce. There are mixed feelings among the Gulf carriers, perhaps provoking Emirates and Qatar to expand faster than may have been previously planned. But market conditions remain strong in the long term, meaning Gulf carrier growth will mostly be sustainable in the future. There are some signs of pressure, such as Etihad's delayed growth in Dallas. Growth now is a reminder to the US of the economic benefits that derive from additional Gulf carrier flights. Local airports and governments – even at some US carrier hubs – are supporting Gulf carriers. They refute US airline claims Gulf growth equates to decreased US jobs. If there is to be a capacity freeze at Jan-2015 levels, that will mean capacity plans would have to be retracted, directly affecting local authorities, airports and tourism interests in growth. 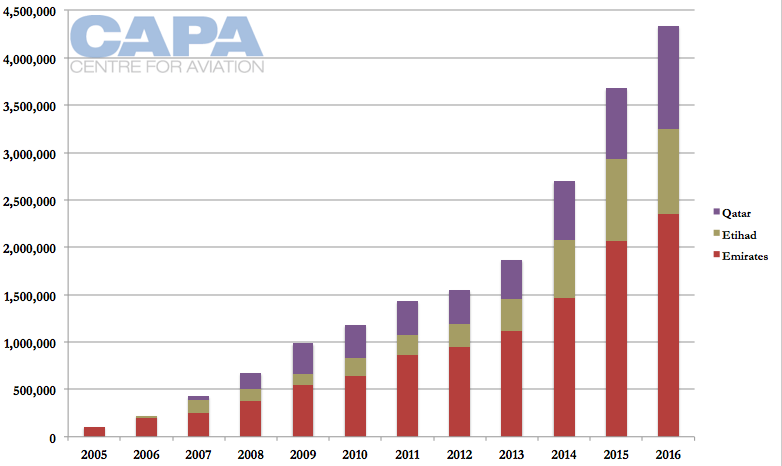 Gulf airline growth in the US should be considered outside the context of the current debate. The US economy is strong, and another long-haul market – the trans-Pacific – is also experiencing rapid growth from foreign carriers. Gulf carriers have developed Australia, Southeast Asia and Europe. Australia and Europe show currency weakness, decreasing their attraction in the short/medium-term. Potential growth markets like Korea but especially China face heavy bilateral constraints. Africa (where US airlines have extensive open skies agreements available for use) is also a large opportunity but slow to liberalise. After developing elsewhere, North America is a natural evolution. 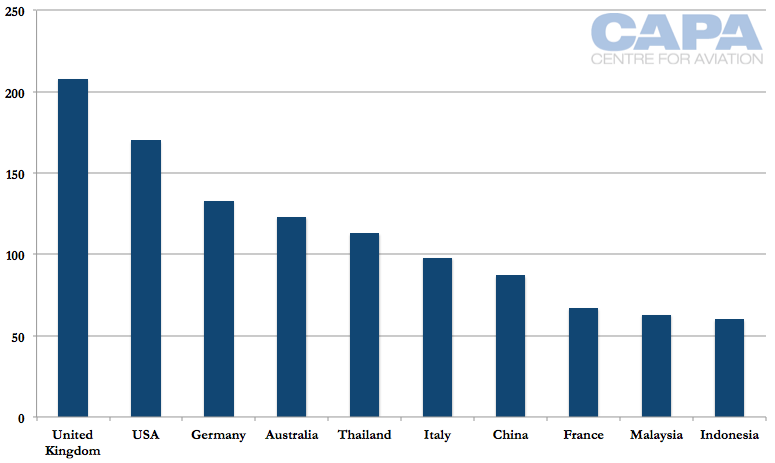 As attractive as the US is, there is also the factor that some other markets currently have diminished attraction. Given recent expansion plans (whatever their purpose), further Gulf growth announcements for the US are now likely to be limited. The long term opportunities in the US remain bright for Gulf carriers – and for the US economy. As for the larger story of Gulf carrier growth, those airlines argue that the US carrier opposition has parallels to those they have heard on other continents over the years. It might be asked why the Gulf carriers have been unable to prevent these repeated arguments, and what the future holds. In some markets there are deeply entrenched competitive attitudes supporting the need for improved air services, with their inherent value to local economies. In others, where legacy flag carriers are disproportionately influential, there is continuing pushback. Inevitably, the Gulf airlines are a disruptive force, challenging the status quo. Both Etihad and Qatar have remarked certain European airlines are bringing to the European Commission the arguments and evidence their US partners are using. Mr Al Baker said the current US carrier antagonism was a “proxy fight on behalf of European partners”. As a broad opposing alliance emerges between a handful of North American and European flag carriers, the Gulf airlines – each with its own history and agenda – are being forced to re-evaluate their strategic responses. This will play out over the next few months. The outcome, for better or for worse, will have an indelible impact on global aviation operations.